I mentioned last month that I had one more box for kids that I would make available before the end of the year - here it is! 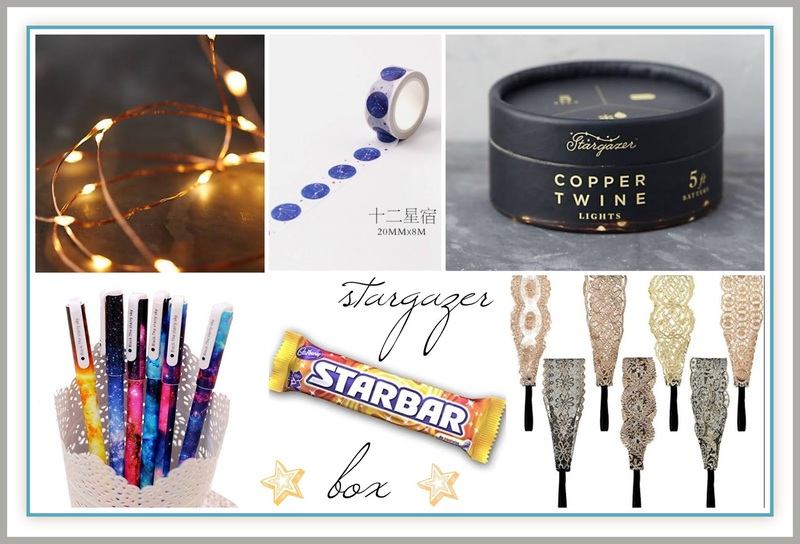 The Stargazer box. I think it is SO perfect for this time of year! Let me get the fiddly details out of the way because I'm doing things a bit differently - from here on out: I will only take orders for boxes via email at juliasbookbag (at) gmail (dot) com. Not here in the comments, not on Instagram, not via direct message on Instagram, not on Facebook - ONLY VIA EMAIL. It's too confusing for me to ping pong all over the place taking orders. In your email inquiry, you must give me your LOCATION so I can estimate shipping! Also, very important note - invoices unpaid after two business days will be cancelled. Third important note - I CAN ONLY MAKE (4) FOUR OF THESE BOXES. Four. That's all! Let's talk about this box! I love it so much! I've had this box in the works for awhile, because it took AGES for the candy to get to me. This is a really special box. It will have these AMAZING Stargazer copper twine lights, and they come in the most gorgeous packaging. If all I did was drop these lights and a book in a box and call it a day, this would still be such a fantastic present. - one Star Bar chocolate candy, shipped in from the U.K.
'Peter and the Starcatchers' is a super fun book that details Peter Pan's backstory; it's a prequel, and the first in a series. You find out how Hook becomes the way he is, how Peter gets to Neverland, and where pixie dust comes from. Best for ages 10 and up. 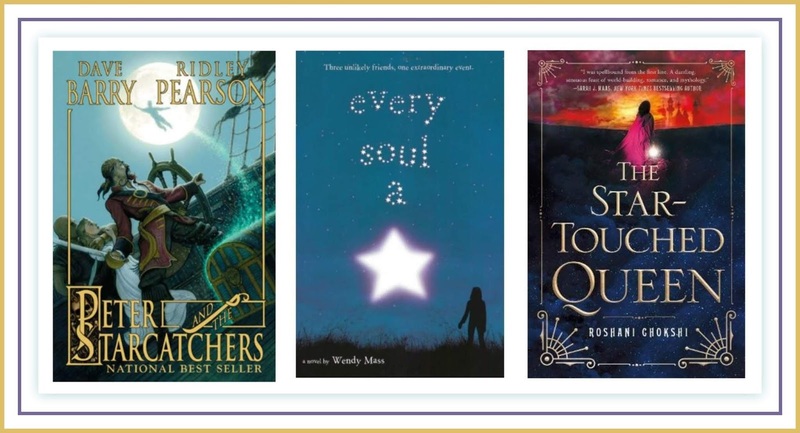 'Every Soul a Star' by Wendy Mass is a book that Julia adored last summer, about three middle school aged kids who are thrown together at a campground while waiting to see a total solar eclipse. Tween-age kids, their fears and innermost dreams, astronomy, and a story about how even young friendships can transform lives - this one is great for kids 12 and up. 'The Star Touched Queen' is a YA fiction book by Roshani Choksi that I read a few months ago, and I ADORED it. Serious, serious love for this story that weaves Indian folklore into a magical romance. I was enchanted by every bit of this tale about a girl who tries to rise above her foretold-at-birth horoscope, which seemingly dooms her to a life of destruction and death. This one is just wonderful! The sequel is at the top of my Must Read list. Best for ages 14 and up. SO! - depending on the age of your kiddo - this box can work for upper elementary ages, tween ages, and high school ages. I will wrap this box in an outer layer of packaging, so that the inner box can be given as a gift. In case, you weren't AWARE - the holidays are coming up! This would be such a darling gift package. This box will be ready to ship at the end of October/early November. Feel free to express admiration in the comments ha ha, but remember - if you want to order this box, you must email me! I hope you sweetie enjoys it! !